During recent days, pronounced severe convective storm activity has occurred across Europe, reports of which have been collected into the ESWD with help of ESSL’s partners. In total, we have received over 360 reports in the past 7 days. A majority of them were of large hail (184 reports), followed by severe wind gusts (79 reports) and heavy rainfall (66 reports). The first notable event was 29th April, where a tornadic supercell tracked more than 500 km from central France to Belgium. Wind damage caused by this supercell is still being investigated to confirm possible occurrence of several tornadoes along its path. On 1 May, a long-lived supercell over eastern Poland produced a hail swath 300 km long with hail up to 5 cm in diameter. And one day later, series of severe storms struck Croatia, Slovenia, Hungary and Austria. Hail up to 6 cm in diameter was observed over northeastern Slovenia, damaging houses and numerous flash floods were reported from Vienna, where storms persisted for several hours. A new study led by ESSL researcher Dr. Tomáš Púčik shows how climate change will affect weather conditions responsible for severe thunderstorms. 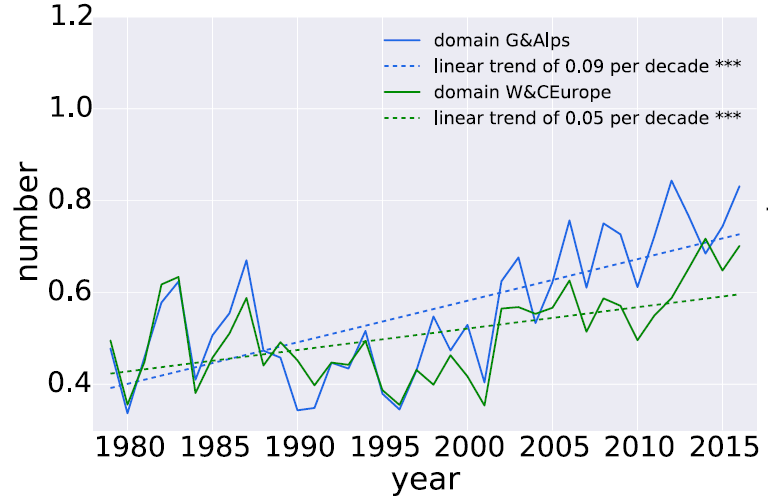 In the study, which has appeared in the Journal of Climate, no fewer that 14 regional climate models were studied. Because climate models are still too coarse to simulate convective storms directly, the researchers looked how often the three necessary ingredients for severe storms occur: unstable conditions, a strong change of wind with height, and a mechanism to trigger the storms. The climate models predict that strongly unstable situations will occur more frequently, because the water vapour content in the lowest air layers will increase. At the same time, the wind shear, a factor important for the development of well-organized supercells, will not change much. As a result, severe convective storms are forecast to occur more frequently, with the strongest increases scenario with higher greenhouse gas emissions. 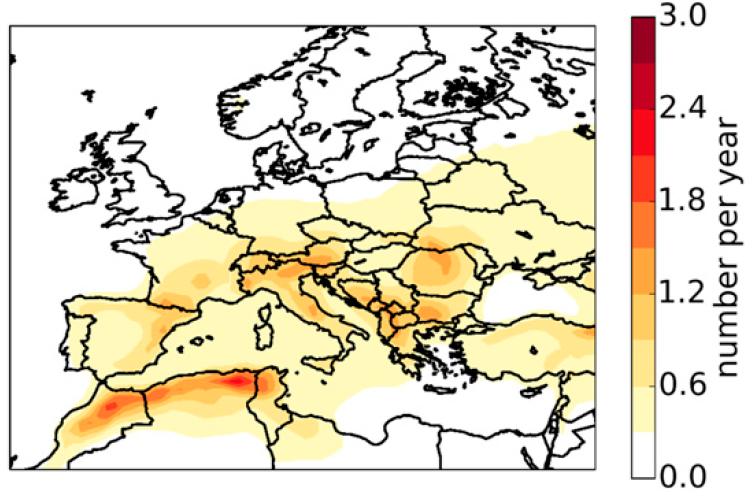 The increase is not geographically uniform and considerable uncertainty remains about the future changes in severe convective storm frequency over southwestern and southern Europe, due to a drying in the summer season. Tomáš Púčik, Pieter Groenemeijer, Anja T. Rädler, Lars Tijssen, Grigory Nikulin, Andreas F. Prein, Erik van Meijgaard, Rowan Fealy, Daniela Jacob, and Claas Teichmann, 2017: Future Changes in European Severe Convection Environments in a Regional Climate Model Ensemble, J. Climate, in press. Present annual number of 6-hourly periods with high instability, strong wind shear and precipitation in the period 1971-2000 (a) and the changes expected in two future periods according to a scenario of moderate climate change (rcp4.5, b. and c.) and strong climate change (rcp8.5, d. and e.). Within the RAIN project, ESSL researchers Tomáš Púčik and Pieter Groenemeijer have produced projections of severe weather changes according to the EuroCordex regional climate model ensemble. 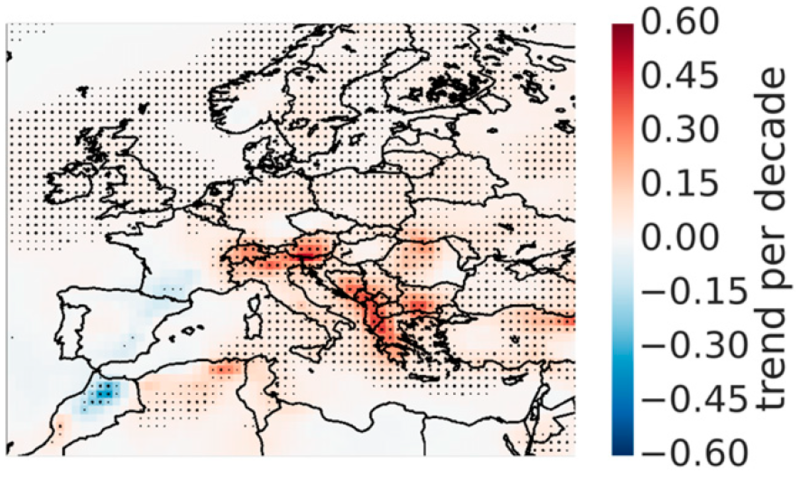 The ESSL researchers found that the consensus of the model projections suggested a 10 – 30% increase of severe convective weather events across much of Europe and 30 – 60 % in south-central Europe in the business-as-usual rcp8.5 scenario by the end of the century. These increases would be about half as large in the rcp4.5 scenario that assumes moderate climate change mitigation efforts. RAIN project partners of the Finnish Meteorological Institute, Freie Universität Berlin and the Technical University Delft have investigated other hazards, such as wind storms, floods, forest fire and winter weather. Click here to download the latest ESSL Newsletter 2015/2 in PDF format. European Weather OBserver app launched! 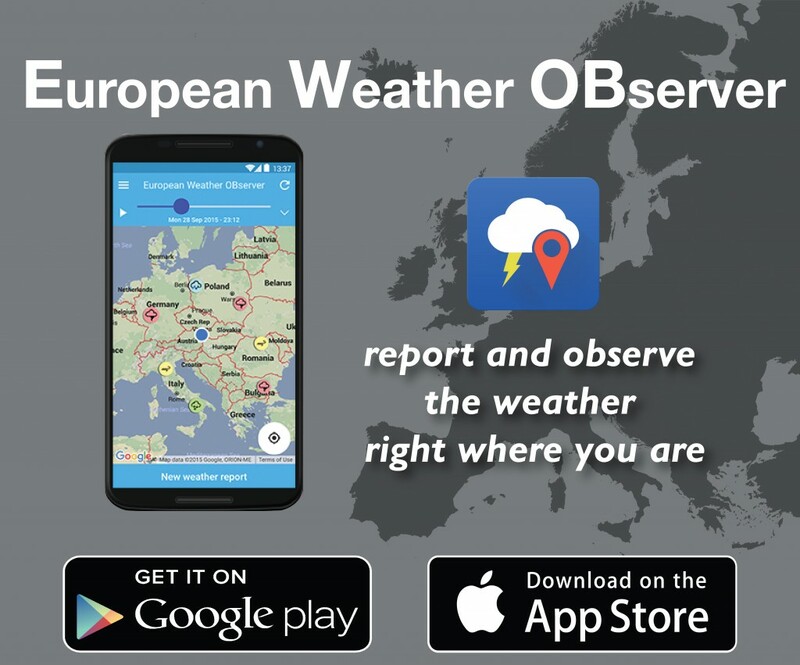 ESSL has lauched a free app called EWOB (European Weather OBserver) with which one can report and monitor the weather situation around oneself by viewing the reports of others. With the app, you can send a picture along with your report and to share it on Facebook or Twitter. By developing EWOB involves the public in collecting important “big data” regarding severe weather that will help weather forecasters, researchers and risk modellers to improve preparedness against severe weather. To get the app, search for EWOB on Google Play or in the App Store! The latest reports you can also see on our web map here. The scientific programme committee of the ECSS was very active during April and May checking all the submitted abstracts. The letters of acceptance were sent out on 28 May to those who submitted abstracts for the conference. The letters of schedule (including the type of presentation – oral or poster) were sent out on 7 June 2015. The conference will take place in Wiener Neustadt, located just south of Vienna between the Alps and Lake Neusiedl, and easy to reach from Vienna airport. We expect an exciting week that will feature all aspects of severe storms, ranging from their forecasting to climatological aspects and from storm detection by radar and satellite to their impacts. Confirmed keynote speakers include Greg Carbin (Storm Prediction Center, Norman, OK) and George Bryan (UCAR, Boulder, CO). On Wednesday, a panel discussion will address the challenges of storm forecasting in Europe. In addition, there is an extensive programme of social side events. The Local Organizing Committee and the Scientific Programme Committee are looking forward to welcome you in September in Wiener Neustadt. Follow this link to the ECSS conference information page. From 1 to 5 September 2014 ESSL organized a workshop dedicated to the field of forensic meteorology: The first two days were dominated by expert presentations and very active discussions. On Wednesday and Thursday the whole team went to Slovenia and Italy to recent damage sites. Participants split up into four groups, three persons each group, and went into the field in order to assess damage to buildings and trees.